Manufacturer & Exporter of Heavy Duty Slotting Machine which suitable for tool-room or high speed batch production and for shaping or cutting materials and Mini Slotting Machine which is used in the automotive, furniture, electrical, construction and other heavy industries. 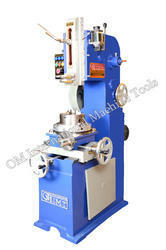 Slotting Machine is produced and exported by OM International Machine Tools in India. We are the no.1 Slotting Machine Manufactures of Vertical Slotting and Slotter Machine. We are a famed enterprise that is occupied in manufacturing and supplying precisely-engineered Slotting Machines. Has adjustable mounts and slides, this slotting machine is broadly used in steel rolling mills, paper mills, power plants, textile factories and other similar industries. At our premises, this slotting machine is manufactured with utmost care by using quality tested components and cutting edge technology. Also, we offer this slotting machine in plenty of specifications as per the ever evolving needs of the clients. No. Of Speed To RAM By Gear Box 2" 2" 4" 4" 4" 4" 4"
Max. Dia of Work Admitted 20" 32" 36" 48" 48" 48" 72"
Max. Height of Work Admitted 7" 9" 11" 18" 22" 22" 24"
Longitudinal Traverse of Table 9" 15" 18" 24" 24" 24" 36"
Transverse Traverse of Table 10" 12" 15" 18" 18" 18" 24"
Dia of Rotary Table 12" 15" 18" 24" 24" 24" 42"
Power Required 1 H.P. 2 H.P. 3 H.P. 5 H.P. 7.5 H.P. 7.5 H.P.